Thanks for all the input last week on my decision to try and come up with a “signature” scent. I know going “cold turkey” is not the way to do it, and I’m starting to think that a small grouping is likely to be a better idea. I’m reminded of the movie Sideways, and the scene where Paul Giamatti is asked about his wine collection. He refers to it as a “small gathering in a closet”, which is how I’ve come to view my fragrance collection. Except mine resides in a drawer. Speaking of closets, I was subjected to my first tennant “inspection” the other day. A couple of guys came in and changed the battery in my smoke detector, which was an excuse for the property manager to waltz in (she being a rather diminutive woman with what I believe is a bit of a “Napoleonic” complex. Definitely no Josephine in this broad.) and fling open my closets. I’m guessing that my abode is the exception rather than the norm in most cases. She was probably looking for clandestine damage and other such effrontery. Good thing she didn’t look behind my wall mirror to spy the chunk of plaster I inadvertently removed when hanging it. I swear, in my hands, a hammer is a weapon of mass destruction. I used to love mixing this together with Revlon Milk Plus Six shampoo. Together, they were the perfect combination of lemon and vanilla. And that’s where it all started. I remarked to some of you that I would love to go back to wearing Annick Goutal’s Eau d’ Hadrien once again. I drained bottles of that stuff in the late 90s – I’m talking about 3 of the 500 ml sizes. I guess that’s why I stopped wearing it. But, it was always appropriate, and always made me feel good. Another fave used to be Fresh Sugar. Again; wore it to death. I also get a bit of lemon from Philosophy Pure Grace, even though the notes are some sort of well-guarded secret – there’s definitely some lemon in the composition. There are others I’ve tried – a couple of the Carthusia scents, Rosine’s Rose d’ Ete, Eau de L’Artisan, which I believe has long since been discontinued, and Hermessence Rose Ikebana, which is way more grapefruit and osmanthus than rose. Two other favourites are Ave Luxe Citrine and that discount e-tailer stalwart, La Perla Eclix. I’m thinking of starting over with Pure Grace and Fresh Sugar, since they are relatively easy to get, and inexpensive to boot. We’re also coming into warm weather, and I know I’m not going to be able to stand anything stronger than those. My only gripe with these types of scents is that they don’t hang around very long. But they’re fresh, bright and uplifting. Just what the doctor ordered. OK, fess up, do you like citrus with a twist of vanilla? I’m not talking fruity floral. Did you ever try Jean Nate? It has a lemony, citrusy, fresh scent with some vanilla in there to boot. Can you still get it? I haven’t seen it anywhere in years. Jean Nate! God, I loved that stuff. After swimming and sunning all day in the summer when I was 12, 13, 14ish I used to shower and the. LIBERALLy douse myself with the splash. Fantastic! Also loved Jovan Eau Fresh with the watercolour label. Good old Jean Nate! I remember it as lemony, although I haven’t used it in many years. It is readily available in CVS drugstores in the US – I’ll have to pick up a bottle for old times’ sake. I’m pretty sure I saw Jean Nate in Shoppers Drug Mart recently (in the bath products section). They definitely had Love’s Baby Soft — can’t remember if they had Fresh Lemon which I preferred. Also loved the Lemon Up shampoo (along with the original Herbal Essence[no s at the end] shampoo). Thanks for the blast from the past. Love love love citrus-vanilla scents. If you ignore all that greenery and lilac, Calvin Klein Truth is, or used to be (I haven’t smelled it in a while), a lemon-vanilla scent. You could say that Shalimar is basically a lemon vanilla. I mean, there’s a lot of other stuff going on in there, but the top is a huge whack of lemon and bergamot and after that there’s boatloads of vanilla. I’m a lemon vanilla girl, for sure. I’m also with you on the Shalimar. After swapping away my EDT, and falling hard for (are they similar or the same?) Eau de Shalimar and Shalimar Light, I procured some vintage EDC. The drydown of this one is soft lemony vanilla love for me. I’m kinda obsessed now with trying the vintage EDT, to see if maybe that version is different from whatever turned me off the current formulation. I agree completely with you Shalimar lovers. I adore Shalimar Ode a la Vanille which I find to be very lemony, but not lemony in a juicy way, more lemon extract way or the essence of lemon way. It is a remarkable fragrance. OK, you’ve officially created a lemming. Lemming here too! I absolutely adore Shalimar EDP so off I go to hunt down Ode de la Vanille. Citrus with a twist of vanilla makes me think of curdled milk. Me too. Lemon I love, and I like a subtle vanilla drydown, but I can’t wrap my nose around putting them together. Lemon lover here too! Have you tried Smiley? Lemon & patchouli yumminess. I cant think past mixing Lemon Up and Revlon plus six–it just sounds like such a good idea. I love pure lemon fragrances and Lostmarc’h DinDan is perfection. i Profumi di Firenze Limone di Sicilia is an awesome super zesty lemon perfume. Yet another citrus favorite is Chanel Cristalle Eau Verte (more lime than lemon). However, if you prefer a softer, sweeter citrus perfume, you should try Dior Escale à Portofino or maybe Creed Virgin Island Water. I used to love original Cristalle. Eau Verte is a bit too “green” for my liking. I second Escale a Portofino. It’s my favorite refresher in the summer. My favorite lemon ever is Mona di Orio’s Lux. Lemon + incense, rather than lemon + vanilla. I ran out last summer and hope to replace it before the high heat of the midwest hits. I really like the Mona di Orio scents; I just find them unbearably heavy. This one is my favorite take on lemon too, Catherine! Though I also really enjoy Ava Luxe Citrine. I can’t offhand think of a lemon/vanilla fragrance I know of, but I love the citrusy deliciousness of AG Eau du Sud. There’s something about Hadrien that gives me that back-of-the-throat allergic thing, but it’s not there with EdS. Also loved the very cheap and no longer in existence Archepelago Botanicals Yuzu. Lovely clean and crisp grapefruit. CSP Kumquat was another beauty that, unfortunately, is no longer available. How about Vanille Incensee – it is a nice lemon/ lime with vanilla, a little powdery, but I really like it. It lasts all day on me too, and the small bottles are not too expensive. I haven’t smelled that yet, but you’re not the only one who has good things to say about it. I really like Vanille Insensee too, though I get more of a vanilla orange creamsicle from it. Wore it to work a couple days ago and got lots of compliments! My favorite lemon vanilla perfume is the original MaxMara. It has a lovely lemon note along with fresh sweetness from sap and sugar cane (but not too sweet) with a warm base of vanilla and cashmere wood. I don’t hear this one discussed much, but I love it in spring and summer. How did I miss that one?? Sounds lovely. I totally forgot about the MaxMara! Wonder if I can track down a sample/decant? Thanks for the reminder! I would love some Lemon Up and Milk Plus Six right about now. Also some Body on Tap and Farrah Fawcett shampoo. Those were some amazing-smelling suds! I own a full bottle of Fresh Sugar that a dear friend gave me and I like it, but I would prefer it to be less sweet. At least, on my skin I smell lots of vanille. But it is quite nice. As I mentioned to Nava, below, try Fresh Lemon Sugar (I’m assuming you are talking about the original Fresh Sugar, right?). Very lemony, not nearly as sweet as the original, without that Pledge Accord. They just released “Brown Sugar” that supposedly smells like their scrub. Can’t wait to smell that one, too. I’ve tried Lemon Sugar, but I prefer the original. As I’ve said, I’ve got my sights set on Brown Sugar the next time I land in Sephora. I was going to suggest you try the Brown Sugar one! I think it smells really good — like the sugared rim on a citrusy cocktail, like a Lemon Drop or a Sidecar. Can’t vouch for how long it lasts though. Another cheap lemon I like is C.O. Bigelow Winter Lemon. And Moschino Funny is my grapefruit of choice. Hi Nava, hope you are doing well. Great post! 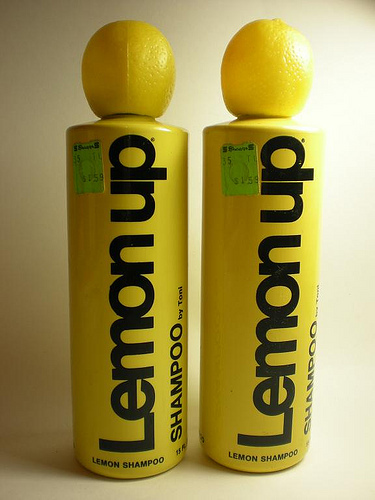 Especially got a kick out of the pic of the Lemon Up shampoo — where else can you get such fun from a bottle of shampoo? (Except maybe for Gee, Your Hair Smells Terrific.) I had forgotten all about that Revlon milk shampoo — good stuff, too. And mixing the two? Sheer genius! I’m with you on the lemon-vanilla love train and enjoy Eau d’Hadrien as well. I also like Creed’s gentle citrus-y Sublime Vanille but it’s just so darned pricey. And as others have mentioned, Dior Escale a Portofino and Atelier’s Vanille Insensee are lovely. Happy weekend to everyone (and spring break for some)!! I’ve been experimenting with essential oils to make room scents for a diffuser. I have green lemon and I have vanilla and will try mixing them today. I love citrus, but it has that problem of not lasting. Sometimes I put a dab of bergamot essential oil on my sports bra when working out (actually more than a dab) and it punches up whatever citrus fragrance I’m wearing. Laura Tonatto makes a citrus that lasts well, and Jardin sur le Nil does too — that’s more grapefruit, though. Nava – great post…brought back a lot of memories with Lemon Up and Love’s Fresh Lemon…loved both of those back in the day. Now, my favorite lemon is Diorella. I’ve not tried lemon/vanilla mix but it sounds like something I need to check out. my favorite citrus/vanilla mix is Boucheron Trouble–citron vanilla and a big dose of jasmine. Oh that’s a good one! Another great citrus/vanilla is Creed Sublime Vanille; people who like Shalimar, will probably like that one too. That’s one of the newer Creeds, isn’t it? Must check out that one. Those pictures of Lemon Up made me smile. I used to love it. ohhh I loved Lemon Up shampoo!!! I hada vision that it would turn my dark hair blonde lolol. My favorites are Shalimar Eau Legere (the Laurent version), Neil Morris’s Vanilla Rose, Tocade and Une Rose Vermelles Tauer. Lemon and vanilla, although not always (or just) together. BTW I smiled when I saw your illustration, I loved Lemon Up too, and Love’s Fresh Lemon. I like L’Occitane Vanille Citron, but I understand it’s been discontinued. And we could argue, if we squint, that Shalimar is the ultimate citrus-vanilla. I think L’Occitane has a honey and vanilla scent now that has a bit of citrus to it. Must investigate that. The picture of Lemon Up just gave me such a lift! I don’t remember how well it performed (I was a kid; did it matter? ), but I loved the smell of it. I have a few things that feature lemon, but they don’t mix lemon and vanilla. I’ve been craving both of these notes over the last few weeks. Time to try it out! I was such a little grease-ball as a kid, I sometimes thought about using straight lemon juice as shampoo. That lemon cap was classic. Could you imagine something like that today? What about Vanille-Tonka (lime and vanilla – and incense)? My favourite burst of pure citrus is O de Lancome. Jasper Conran Woman and Burberry Weekend also aren’t bad for super cheap options. Le Labo Bergamote 22 is a more expensive option. I love Le Labo Bergamote 22, but it’s an awful lot to spend for something that goes bye-bye so quickly. Have you tried Fresh Lemon Sugar? It’s way more lemony than the Fresh Sugar and doesn’t have the Dreaded Pledge Accord. I bought several bottles of Marc Jacobs Lemon cologne last year ($19 @ TJM) and enjoy it mucho. Lemon is always one of my standbys. When I found Fresh Lemon Sugar I was at Gump’s and was stunned to find out it was a) only $22! 😮 (you can’t buy anything at Gump’s for $22) and it was goooood. Have you tried Pamplemousse Rose? Granted, it’s not lemon but it has a softer feel and is gorgeous. I would define it as one of those 24/7 scents. ps. preserve your security deposit. Go get some drywall tape (the mesh kind) and a small can of spackle. Fix the hole. It’ll take about 32 seconds. No security deposit required here in Ontario. :d You’re only required to pay first and last months’ rent on a one year lease. Then it goes month-to-month with 60 days notice required before you vacate. This is a 50+ year old building. The plaster in this place is like iron! I’ve tried Pamplemousse Rose, but I much prefer Rose Ikebana. At least that one sticks around for a while. I think the osmanthus note might have something to do with that. On me, it’s pretty tenacious. Lemon with a twist of vanilla makes me think of an English Tea for some reason. There is something enchanting about the sparkle of citrus with the sensual flirt of the exotic vanilla. And that’s why I love it! Earl Gray tea contains essence of bergamot, but it’s not quite the same as straight up lemon. Sweet trip down Memory Lane, Nava! Lemon Up was all the rage when I was in high school and college. (Yes, I *am* that old!) I remember it creating instant highlights during the summer – so much less mess than squeezing fresh lemons. As for your hunt – my first instinct is to say Vanille Insensee, but the citrus not3e is more lime than lemon. In a pinch there’s always Imperiale. I was playing alchemist in the shower with those shampoos pre-high school! I wish I knew why the notes in those scents are such big secrets?? I have a hanae mori sample from Nordie’s men’s dept that’s lemon and vanilla and it’s not a felicitous pairing. I don’t like a lot of citrus just because it seems to in everything. But I’m wearing SMN EVA as I type. Oh my, Lemon Up shampoo! I haven’t thought of that stuff in years..
Don’t forget about Chanel No. 5 Eau Premiere! My favorite with lemon and vanilla. The thing about citrus for me is that it goes away too quickly. Put it on, smell it (nice), oops… where did it go? Five minutes isn’t enough for me, so I tend to end up not buying them. That’s why I like to pair it with vanilla. The warmth makes it last a bit longer. I believe the Vermont County Store sells Lemon-Up shampoo these days. If I thought it would be kind to color-treated hair I would buy some, but…. I loved Love’s Fresh Lemon, but it lasted a fresh minute or two on my skin. I buy a new small bottle of Fresh Lemon Sugar every summer, and use it all. Love that stuff. Do you have Bath & Body Works there? I have a Lemon Vanilla body spray that is nice, but of course, not long lasting. It’s part of their “Summer Vanilla” series which has coconut vanilla and apricot vanilla and others, kinda like CSP. B&BW also have a straight “Fresh Lemon” spray, and CO Bigelow lemon, lime and orange EdTs. I used Lemon Up for years as a kid — I adored it, especially the lemon-shaped cap! It began for me also a lifelong love of that sharp, pungent little citrus. I quickly graduated to Avon Lemon Velvet (the scent of which today will make my eyes mist) and Jean Nate “friction pour le bain”. After that has followed lemon and other piquant citruses like lime and grapefruit — everything form essential oils to sophisticated blends in which lemon plays a key, if understated role. Vanilla, in perfumery, has the opposite effect on me. I find it generally soporific at best. Although, it does figure in one or two absolute favorites, such as Poivre 23 and White Aoud. I love me a good lemon frag! But speaking of Eau d’Hadrien – there’s something about it that worries me and I haven’t been able to get to the bottom of it. Rumors about a reformulation (perhaps due to restrictions on citrus ingredients..) came up about 2 years ago. Some people said they noticed it had become flat or less natural smelling – I think Isabelle Doyen of Goutal commented that the formula had only been made slightly more intense so it would have more longevity. According to her nothing else had changed. I haven’t been able to smell a recent bottle of Hadrien myself yet, so if anyone of you has more info or experiences, please do share… Any word from you, Nava? It’s probably my absolute favorite citrus fragrance. I now treasure my huge 450 ml bottle and hope we can still get this and enjoy its zesty spirit in the future. I’m a big fan of the combo too. That’s why I´ll add my vote for one of my standbys, Shalimar Light. Lurve it. Victoria Secret Lemon Vanilla body spray smells exactly like a lemon meringue pie. As a matter of fact, no, I do NOT like citrus scents paired with vanilla. I was treated to Jean Naté after a bath when I was very little, and then as a middle schooler to a now discontinued incarnation of lemon made by Revlon. I think it was called Wild Lemon. These days, I give credit to all citrus, whether it’s lemon or not. I’m fond of Jo Malone’s lime-basil-mandarin confection and her grapefruit scents; I like Annick Goutal’s Eau du Sud; and I’m a sucker for Eau de Guerlain, even though it’s a “masculine” designated scent. I’ll also reach for Eau Dynamisante in the summertime. To me, the purest lemon scents are those made with lemons from Capri. Carthusia Profumi di Capri’s lemon soap and eau de toilette are particularly nice.